I first realized something in America was changing back in November 2015. My family was on vacation in New Zealand to visit my sister who was studying abroad there. A Republican candidate for president, Donald J. Trump, was gaining in popularity on the right. Politics came up. I defended the Donald and I came under attack from my sibling. I became far too defensive. Things got heated and personal and have in the intermittent months since then. We haven’t talked politics for quite some time now. With Trump’s rise to the White House, things appear to have gotten only more divisive. At least on the surface. I hope you made it through Thanksgiving without any uncomfortable conversations over dinner. But with everything coming back to politics these days, I’m sure many of you were unable to avoid it. The nation feels more polarized than ever and we were already trending in that direction prior to Trump. He has accelerated the division and the hatred of left vs. right. The personalization of politics and the emotional state Americans have been getting in over politics has become unhealthy. I think it peaked during the Kavanaugh confirmation process, but who knows, things are likely to get worse from here as we are entering into the dreaded 2020 presidential race already (one more time for Hillary?). I contend that the division is likely manufactured and a solid majority of Americans have much more in common than many of us believe is possible. Still, it is impossible to ignore the rise of divisive rhetoric and actions in the country’s political discourse over the last few years. Political violence especially has gotten out of control. Politicians are being harassed at their homes and out at restaurants. Trump supporters are beaten and attacked for wearing a red hat. Senators are confronted in hallways and elevators for adhering to the standard of an accuser being innocent before proven guilty. Civility appears to be out the window today, prompting some to call for a disbanding of the union. Doug Casey, an investor and best-selling author, recently said, “The United States, for one, is way too big to be a single country at this point. I’m pretty confident that over the next couple generations, the U.S. is going to break up into several different countries.” I don’t think that is going to happen. We are different in many ways but that is what makes us great as a country. I’ll get into more on that later. Back in 2010, well before Trump came onto the scene, Pete Warden, CTO of Jetpac Inc and author of multiple books on data and mapping, wrote a piece analyzing Facebook data from 210 million profiles, the patterns that emerged, and how we can split the country up six ways. Just for fun, I’ll briefly summarize the six regions that could form new countries if we decided to disband the union and give up on the great American experiment that is the United States. Stayathomia: New York to Minnesota. People live near most of their friends and they don’t move far. God is low on the list of fan pages. Sports and beer pages are much more prevalent. Would be a solidly liberal country with New York City at its center. Dixie: the Old South. Atlanta is the hub of this network, but South Florida has some connections to New York. God is regularly in the top spot on fan pages. Definitely the most conservative country, even with the inclusion of Florida. Greater Texas: a big radius around Dallas. Ties between Texans and residents of Oklahoma and Arkansas put those two neighboring states into Greater Teas as opposed to Dixie. God is near the top of the list, below the Dallas Cowboys and other sports teams. A very red country, but becoming more Hispanic (on track to be largest group in Texas by 2022). Mormonia: Utah and a part of Eastern Idaho. Communities are very interwoven and unlikely to have many friends outside the region. Mormons make up more than 62 percent of Utah’s population. A pretty red country. Nomadic West: much of the western half of the U.S., outside of Utah, California, and much of Washington. Inhabitants tend to move around the country quite a lot. Residents in Boise, Bend, and Phoenix all have a wide range of connections, much more than what you’d expect from towns of their size. A mix of red and blue, but mostly red. Socalistan: LA, not San Francisco, is the center of this region. Almost everywhere in California and Nevada has links to LA. This is a tight clustered region with Californians connected to other Californians, outside of the two large megacities in the north and south of the state. God is not of much concern to many residents and Barack Obama is on top. A highly populated coastal country of mostly liberals. Pacifica: “the most boring of the clusters,” according to Warden, “the area around Seattle is disappointingly average.” These people are also tightly connected to each other and are not big travelers. When I lived up there it did seem a bit cliquey to me. Just 8 percent of Seattle voted for Trump. Uber-liberal country to say the least. The United States is devolving into a cultural revolution. People take politics far too seriously and way too personally. People increasingly believe political violence is acceptable. People treat others a certain way based on the other person’s political beliefs. Singles increasingly will only date people based on the others’ views of the current president. Families continue to move to locales that are more in line with their political philosophies. It’s all become too much. We need to be peaceful and tolerant of other people. We need to agree to disagree without hating the other side. We need to remember that we are all Americans and have much more in common with each other than we think. The mainstream media continues to stoke the fires of division. They highlight acts of violence and ignore the hopeful stories of unity despite our many differences. We do not need to retreat to our political camps and fight against each other for supremacy in DC. We need to remember that human beings, by nature, are tribal. Nonetheless, we are all of the same culture and creed: that of America. More in Common released a groundbreaking project on America’s current tribalistic tendencies in October, titled, “Hidden Tribes: A Study of America’s Polarized Landscape.” A new international initiative created “to build societies and communities that are stronger, more united, and more resilient to the increasing threats of polarization and social division,” More in Common surveyed the views of more than 8,000 American citizens including six hour-long focus groups and 30 one-on-one interviews with people across seven different population segments. The main takeaway from Hidden Tribes is the fact that today’s supposed division is brought upon us by the radical fringes of both ends of the political spectrum. The media has played an integral part in all of this. They would have you believe that our country is a 50-50 society, divided by two political tribes eternally in conflict. But we all know that Democrats and Republicans claim to fight one another and work for their constituents, all while enriching themselves and growing the size of government in perpetuity. The media’s misinformation and increased politicization has only furthered the apparent divide between the left and the right. Therefore, people think we are more divided today than ever before. From Facebook feeds to the family dinner table, bitter political debates appear to be omnipresent. Most Americans are fed up with this tired “us-versus-them” mindset and are desperate to find common ground for the betterment of the entire country. We hold many different views on a wide range of topics, but more than three in four Americans (77%) also believe that our differences are not so far apart that we cannot work together. We are not a country of Democrats and Republicans. We are a country of seven distinct groups. We are bound together by what we believe, not by whose “team” we are on. If you want to see what tribe you fall under, take the short quiz here. The two far wings of these tribes of America have hijacked the political discussion and receive an inordinate amount of media attention. 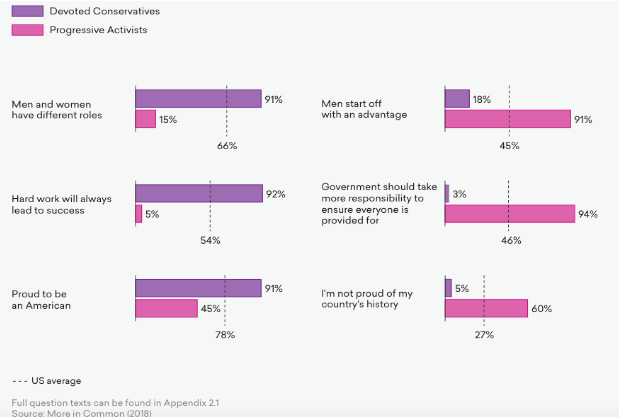 Progressive Activists and Devoted Conservatives make up just 14 percent of the population, but they have taken over the national conversation. 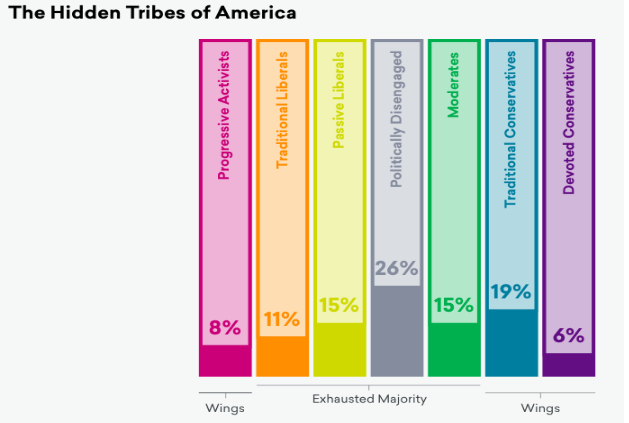 Along with Traditional Conservatives, who value much of what Devoted Conservatives do, these three tribes or wings of the Hidden Tribes make up just one-third of the population. These groups’ distrust and fear of the other side has created the polarized environment we have today. 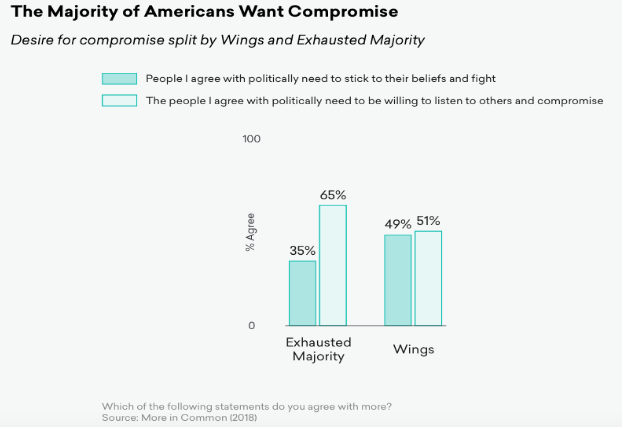 This divisive environment is important to keep in perspective, however, as two-thirds of the country are in the “Exhausted Majority.” Americans in the majority are much less certain about their views and hold a wider range of beliefs. They are also much more open to compromise and change while holding a much less hateful view toward those they disagree with. Long story, short, we have much more in common than we think. While it might be hard to identify with the other side sometimes, we all want what is best for our country and our families. Though we have different ways of achieving that, we can all do a better job of working together and paring back the divisive rhetoric that is bringing us closer to a cultural civil war. 81 percent of the population agree that racism continues to be at least somewhat of a problem in the U.S.
Here’s my final plea. We are all Americans. We cannot continue to be divided by the media, the two political party establishments, and our radical ideologues on separate ends of the political spectrum. We need to learn to come together and fight for America instead of fighting against each other. We need to learn to have open and productive debates about the many serious issues facing our country. We need to be open to compromise and willing to change our viewpoints so we can move forward as a country. And finally, we need to stop the acts of political violence before someone gets killed.